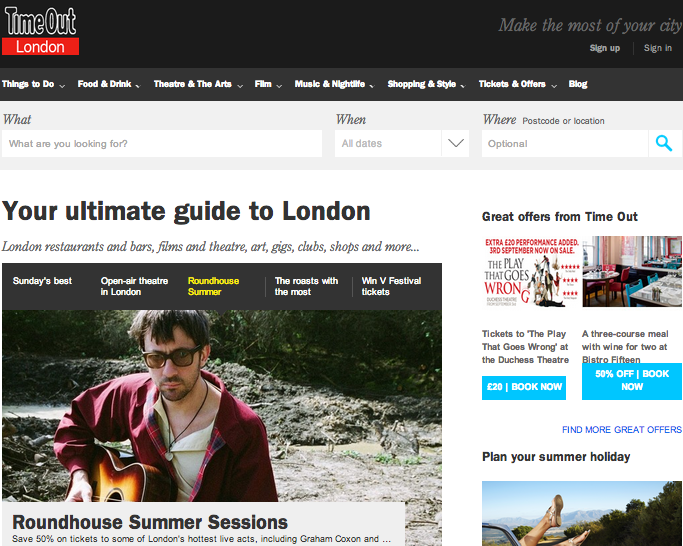 Timeout London is one of the most in-depth and reliable sources you can find when it comes to entertainment in London, compiling the most up to date offers available throughout the capital city. It features some of the nicest places to eat in London, as well as all the best theatre tickets and shows and a huge variety of other activities including festivals, museums, nightlife and shopping. There’s nowhere better to find all your favourite things to do in one place, and with reviews, ratings, information and tips on everything featured, you’ll have all the guidance you need before making that all important decision. However, be wary of the reviews, as some are a little dated. Contains a wide range of film reviews, helping make that decision of what to watch that little bit easier… or harder? Timeout is perfect for those looking for current deals and tips on a range of different activities. Whether your interests lie in theatre, film, music, the arts, or general sightseeing and eating – it’s guaranteed to steer you in the right direction.